Published by Enitharmon Press, 1997: for more information click here. “It is rare these days to find a book of poems that is so focused, so carefully shaped and so moving”. Anne Stevenson. Blurb. “A substantial collection on big themes – birth, exile, illness, persecution and death. The author’s voice is both public and personal . . . the lyrics about the poet’s relationship to his infant son remain with me for their delicacy” Orbis. “I hope very much the advent of proactive fatherhood will spawn more poetry as tender, humourous and, in places, profound as this” Gillian Allnutt, Poetry Review. “Crucefix uses a quotidian, work-a-day language that doesn’t holler and doesn’t hang about. Its lack of rhetoric sits easily with the subject-matter, at once so ordinary and so remarkable . . . Just as the first and third sections of the book dare to be ordinary, the second undertakes a brave experiment in allowing two languages distanced by history and syntax, to swim together in single poems” Vona Groarke P N Review. A madder ghost can haunt us all. We see the ghost in our own reflection in the faces of earlier generations. We see it again in the looked-for resemblance to the newly-born. 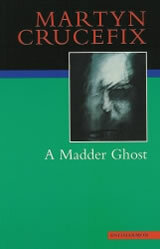 There are times, in Martyn Crucefix’s new collection of poems, when the madder ghost is glimpsed as a solitary wanderer; at others, it is a figure of confidence, proclaiming something akin to Shelley’s ‘madness’ that nothing in the world is single. Accordingly, every individual poem in this startlingly original collection stands fully achieved in its own right, yet is steeped in the rhythms and imagery of those around it. Separate pieces build, through the deft and exciting narrative control familiar to readers of Crucefix’s previous work, to sequences concerning the birth of a child, the illness of a father and an astonishing dramatic meditation on the author’s own Huguenot inheritance of persecution and exile.